Mountain Living | Enjoying the Creative High Life! So all the blogs said it would be awful, all the boards for trades people said “hire a professional,” but just a few people said it was possible and they had done it. So I took a chance, knowing that my “fix-it” skills were pretty decent, and while I procrastinated for at least two weeks trying to learn more, eventually it was just time to do it! Replacing a bathroom exhaust fan is easy when you have attic access, but when you can’t get above the darn thing it presents certain challenges. The first one is the lack of knowledge as to how the existing unit is installed and what is available for installing a new unit. The fact that my building is a commercial building with condos above retail makes it a bit more complicated as it is all steel and concrete construction and all the do-it-yourself information assumes wood stick construction. Secondly without seeing what’s up there it’s hard to know where to cut the hole in the ceiling – and installing from below absolutely requires cutting a hole in the ceiling. But the darned fan smelled like burning electrical and wasn’t drawing air which was causing problems with condensation on the walls of the bathroom. I had already put so much time and effort into cleaning up the mess caused by the condensation that I just had to replace the darn thing. Time to stretch my fix-it skills. Now solving problems runs in the family, so there is absolutely no reason to believe that I could not figure this out, but still it was uncharted territory and I had the new fan/light in hand for at least two weeks before I worked up the courage to stretch my skills. Part of it was just plain hesitation, part was waiting to have the money to pay the professional if it turned out to be more than I could manage. My ceiling is drywall attached to a metal grid suspended from a concrete roof structure, so I wasn’t sure exactly what I would need or if I would be to acquire the materials up here to support the unit. And honestly, despite having patched numerous drywall holes in the past, I was a bitsy bit apprehensive at cutting a hole in my landlord’s ceiling. So away I went, knowing at some point I would have to cut that hole in the ceiling, but not sure exactly where to start. So I dismantled the unit from the inside leaving just the housing in the ceiling. That was the last easy part until it came time to patch the drywall. I wasted quite a bit of time trying to figure out how the housing was supported and trying to extract it without blindly cutting into the ceiling. Finally I got the crowbar and tin snips out and destroyed the housing from the inside out to create a hole that allowed me to peer into the ceiling. The problem that caused the old fan to fail was painful to see. The duct had not been connected to the housing properly and had been bent to a 90 degree angle where the duct attached to the unit, so it probably blew off immediately. The only thing that saved us from moisture in the ceiling was the way the bend in the duct fell across the opening and blocked the airflow from the fan. Unfortunately, that meant that there was no place for the airflow to go, and it eventually caused the fan motor to fail. The decision to replace was a good one! One good look was all it took to get the creative juices flowing…..It became immediately obvious that I would not be able to use the existing supports for the new unit. I had to reposition the unit to use the existing electrical wires and the new unit was larger by 1 1/4″ both in length and width and used a different method of support than the original unit…..I measured everything then took a trip to home depot to find what I could to engineer a solution for mounting the new unit. I soon found what I needed and it was time to go to work. I cut the (much dreaded) hole for the new unit which overlapped the existing hole. I figured I would be able to use the bits of the existing hole not used for the new unit to reach up into the ceiling to make my attachments so as to minimize the size of the patch in the ceiling. After many hours and much bad language and all kinds of scrapes and finger pokes and dropped screws I finally had it mounted. It took three days — my day off, much of which was spent at home depot and figuring things out, and two days before going to work. In retrospect, I should have just cut a big ole hole, large enough to bridge from one furring strip to the other so I could just screw my patch to them and have plenty of room to work on the exhaust fan. If I had done this the entire process would have been very easy! I made it a lot harder than it ever needed to be. Regardless, I got the whole thing in, patched the ceiling, applied the orange peel texture to more or less match the rest of the ceiling and primed and painted! Now when I walk in and flip the switch I have to pause a moment to make sure the fan is on. I look up to see the new, quiet, efficient fan and feel the air pulled in under the door and I feel an immense sense of accomplishment. Despite being scary, I stretched. And it feels good! Not as good as maple syrup, but pretty darn good! Reminds me to stretch every day! I used to say that sarcastically, in jest, “note to self….” followed by some blatantly obvious statement….. They free me to be so much more creative. I find it is so liberating to be able to immediately write that note down, somewhere I cannot ignore it. I don’t have to remember it more than once….whatever it is, only just long enough to make a note to self and leave it somewhere that I will see it at the appropriate time. I am not sure if this is maturing or finally realizing the value of time and limited resources…to wit, my not so reliable memory! It’s just a little makeover on a bathroom. Necessary because the bathroom started life as a walk-in closet. Some owner at some point in time decided it would increase the value of the property to have an en suite bathroom rather than a closet for the master bedroom. The closet did not have a heat vent in it, despite having an external wall with two leaky windows. Apparently clothes do not need to be kept warm. However, once the unknown owner decided to renovate the closet into a bathroom, it would have made sense to add a heat vent, just because a person has to take clothes off in order to take a shower. And of course the steam from said shower does not mix well with a cold room, especially one with a super cold external wall. 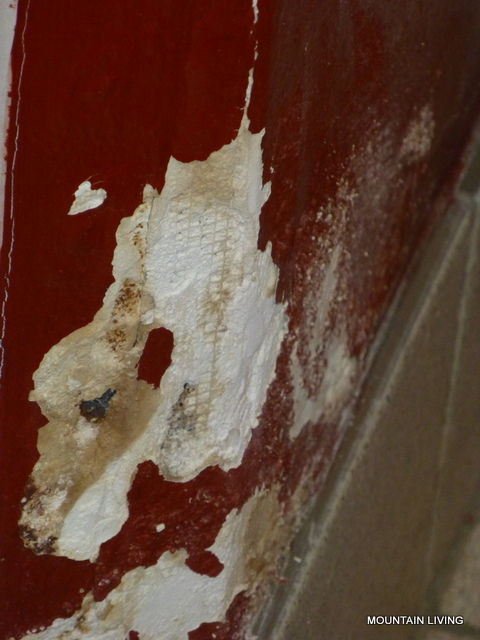 So all of this moisture and cold resulted in damage to the paint on the external wall. Oh and did I mention it was the ugliest red paint that anyone would ever want to put into a bathroom? In addition to the condensation damage there was also water damage that someone did a very bad job of attempting to fix. From the look of things the shower may not have a good water barrier. 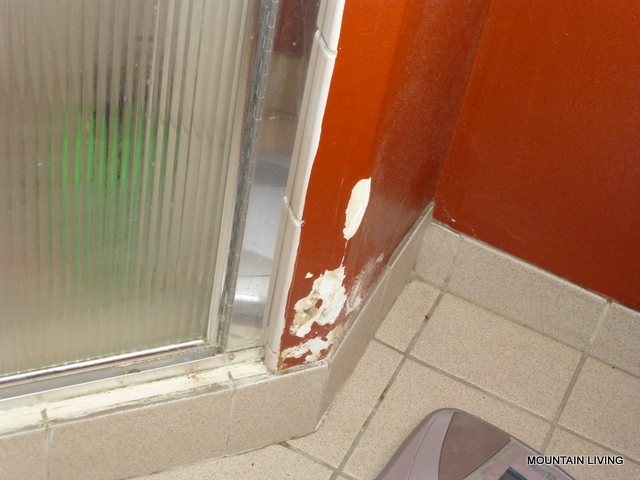 Silicone caulk all around the base of the wall tiles and at various places in the shower floor seem to have fixed the problem for the time being. Fixing things behind the tile goes beyond what I will do for a rental unit. The landlord knows about the problems, the water damage and the poor “fix” was there when he first showed us the property. The wall damage will be repaired as part of this project. And did I mention that this is just an ugly color of paint? This brick red was apparently very popular back when these buildings were built in the ’90s. Now it’s time for this ugly red to go. And for the repairs to be properly done. Fortunately there is another bathroom in the condo, so I don’t have to use this shower while I make the repairs, and prep for painting. But this red will not go easily, I fear. 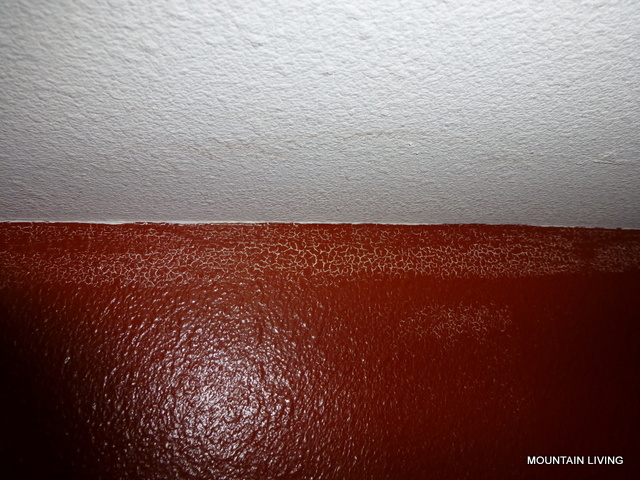 It’s some kind of very glossy paint, looks like a gloss and not a semi-gloss, and the walls have sooooo much texture on them. Time for the orbital sander, I suppose. Something to rough this surface up and maybe knock the tops off the worst of the texture. So, out comes the 60 grit discs and the little orbital sander and away we go…..slowly. This stuff is TOUGH! By the time I get 3 square feet done, the battery is dead and the disc is smooth as a baby’s behind. Off to the big box center…. (I wish we had a real hardware store here.) So away I go armed with NICAD batteries, a new charger and a pack of 25 sanding discs (NOT the super discount ones.) And I spend an entire day sanding and charging and vacuming and sanding and charging and wiping dust and finally, things start to look dull and a bit knocked down. Now the drywall repair kit with the little wire mesh patch cover, sandpaper and that funky spakle that goes on pink and dries white. What a mess. Good thing this mesh will give the thing some rigidity. Maybe I should replace the silicone caulk on the inside of the shower basin to make sure this doesn’t happen again. the worst of the damage. And the rest of the evening and into the night…..This is not a pretty repair. I had to enlarge the hole quite a bit and dig out crumbling plaster that was just slapped in here. I got down to a fiberglass mesh that was probably part of the original corner. The wire mesh patches have an adhesive edge, and are pretty rigid so can be bent to the shape of the corner. Then the spackle clings to the mesh and the whole repair is completely independant of the broken stuff underneath the repair. By the time I had this done, it was time to go to bed and call it a day. It looks like it will be every bit as big a project as I had thought and then some. Not that I underestimated the number of things to be done, just the time it would take to get any one of them done. We, as in everyone here in the Colorado mountains, woke up to a white Christmas this morning. The fresh snow is welcomed by young children of all ages. I am one of them. I will not be up on the ski hill today, it’s work time for all the resort employees, but my job will be easier and my heart so much lighter. I am watching some kids from Florida making snow angels, their high pitched laughter penetrated the windows of the condo and i threw on a coat and went down to see what all the excitement was about. The boy must be about four. He has been running in circles stopping from time to time to jump up and down. The excitement and joy is more than he can contain. He has no concept of snow angels and no room in his little body for anything but pure excitement. His bright blue and yellow snow clothes dim in comparison to his bright joy filled smile. His older sister doesn’t even notice his destruction of her angels. She plops down hither and yon, fanning arms and legs, a bright pink blur of motion, then jumps up and plants both hands on her hips, cocking her head and considers her creation. The pause is momentary then she is off to create yet another angel. She is intent on the angel of the moment, never looking back, uninterested in the blank slope ahead of her. I can’t wipe this big grin off my face as I walk back up the stairs. I am tucking this lesson on living in the now into my heart to take to work with me today. The best gift of all, a lesson in living! It has been snowing, finally. Two storms have turned the world into a canvas of greys and whites over deep greens and blues and purples. The colors of winter storms sing in minor keys. Muted and unobtrusive the landscape bows to the inevitable. I know that these days are not forever, that behind the layers of clouds and winds and storms the sun is shining as she always does. I know the bluebird days of winter will be here, maybe even tomorrow, but for now it feels quiet and peaceful, a land at rest. It is no wonder that Holiday Cards often depict these days. The lovely little vignette of the cabin in the snow tucked into towering pines takes on a peaceful sense of quiet serenity without the sharp shadows and contrast of full sun. The soft skies of greys and slate blues hovering just above me create a smaller, less expansive, almost cozy world. The harsh realities of school shootings, fiscal cliffs, and atrocities inflicted by rebels and governments alike temporarily recede and I am overwhelmed by a strong desire to focus on my immediate surroundings. The world news on radio and TV fades into the distance and this space I live in begs for my attention. This “nesting” urge is badly needed. My home is awash in the final remnants from two storage units as I continue to work on downsizing to what I truly need. It is time to focus all my creative urges on the space I live in, the only space I have for my own renewal. I am focusing my decisions and energy on enhancing my spirit rather than draining my power. The core spaces need my love and attention and creativity. Meditation for my spiritual core, functional exercise for my physical core, and creative energy for my core surroundings. This focus will, by no means be perfect. As always there are things that are beyond my ability to change right now. These will need creative solutions to minimize the negative impact they have on my life. First and foremost among them is the other soul that occupies this space with me. I must learn to dampen my caretaker impulses and take back my time for myself. Too long have I succumbed to the needs of a high maintenance personality. It has been, whether I want to admit it or not, my choice to shift my focus away from the things that I need, focusing my energies on catering to the whims of someone else. In doing so I have created the expectation of constant availability and encouraged the demands. It is, therefore my responsibility to reclaim my space and time. Learning how to this in a loving and respectful way will be my challenge. Although the arrangements are temporary, it will not do to just ignore a bad situation or to create tension or an intolerable situation for the remaining months of the lease. I must expand my creativity….must take it into my relationship with this person and learn to do it gracefully and graciously. This, then, is my Holiday wish list.